The Adventures of Sherlock Holmes was first published in The Strand Magazine in 1891, but the publication of twelve short stories, in 1892, brought the detective and Dr Watson to the masses. In a VisitEngland survey, 43% of respondents said they were interested in visiting locations associated with the writer. And, as VisitEngland points out, it all began in Portsmouth. This is an article I wrote based on a visit to Portsmouth, where the writer worked as a doctor, and his various addresses, and Sherlock locales, in London. As we rattled through the pretty Hampshire countryside, Holmes, seemingly unaware that smoking was now banned on trains, drew thoughtfully on his mahogany calabash pipe and outlined the details of the remarkable medic. I had been inspired to follow the great writer’s trail by the renewed outbreak of Sherlock mania, triggered by the BBC’s Sherlock, with Benedict Cumberbatch and Martin Freeman. At the Portsmouth Museum’s permanent (and free) exhibition they are too modest to claim it, but this must be the world’s most comprehensive collection of books, photographs, posters and objects connected to Holmes and the life of his creator. In 1882 the recently-trained and penniless Dr Conan Doyle arrived by boat from Plymouth. Within four years he had created one of the most famous characters in fiction, while still finding time to play for the local football team. Richard Lancelyn Green, lifetime student of Conan Doyle, bequeathed his enormous collection to Portsmouth on his death in 2004. I spent a happy hour turning up the unexpected and the plain zany. I found an original Conan Doyle waistcoat, his boxing gloves, a Sherlock Holmes pub sign, lots of curly pipes, a Sherlock writing set, and the Peanuts cartoon strip where Snoopy bets that the Hound of the Baskervilles was really a beagle. Posters and photos from 200 film and TV versions of the 60 novels and short stories feature Peter Cook and Dudley Moore among the many to play the Baker Street duo, along with Basil Rathbone, Jeremy Brett and even Daffy Duck as Holmes. Now for some detective work of my own, inspired by Stephen Fry, the Portsmouth collection’s patron, who wrote: “I would walk a mile in tight boots to read his letters to the milkman”. I set off, in comfy shoes, to 1 Bush Villas, Elm Grove, in adjoining Southsea, where Doyle created Holmes in idle moments between patients. But the old house wasn’t there. A random rain of bombs fell on this naval port in the war; one took out the house where the great writer lived for seven years. 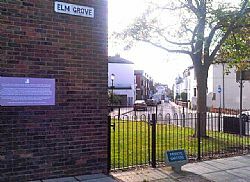 A plaque on a block of flats marks where it stood. I followed Sir Arthur back to London, where he lived for 17 years, and where his own exploits were almost as remarkable as his creation’s. Every true devotee will want to visit The Sherlock Holmes Museum at 221b Baker Street, for its convincingly-recreated Victorian interior of “the world’s most famous address”. Nearby Lord’s cricket ground was the scene of some sterling performances by Sir Arthur on his occasional appearances for the MCC. But in 1900, his career at Lord’s took a turn for the Rowan Atkinson, in the Curious Case of the Self-igniting Trousers. A ball from one of the quickest bowlers in the country hit the good doctor on the thigh. A cursory rub did not relieve the sharp pain. Then the surrounding fielders saw flames sprouting from his flannels. The ball had struck a tin of matches in his pocket. The fire was quickly extinguished. It’s a pity Doyle never used the incident in a plot. He set many adventures in the London streets he knew so well. You may link up the locations in dozens of self-guided walks: most end at a pub. Doylian imagination transformed many an innocuous road into a place of brooding menace. In Conduit Street, at the bottom of Regent Street I half expect a tap on the shoulder from the “second most dangerous man in London” (after Moriarty), Col. Sebastian Moran. For Holmes and Watson, dashing to catch a train to the scene of some dastardly and baffling crime deep in the country went with the job. You can create your own awaydays to places where he lived or which he wove, under literary disguise, into the stories. My unofficial Conan Doyle trail zig-zags through Britain, from Picardy Place, Edinburgh, where there is a statue of Holmes close to Doyle’s birthplace, via Derbyshire, Dartmoor (Hound of the Baskervilles) and the South Downs. One last call is Doyle’s statue in Crowborough, Sussex, close to his last home. He is buried in the churchyard at Minstead in the New Forest, famous forever.